Spend spring by upping your wellness lifestyle and getting creative. Throughout the next few months Mountain Shadows is hosting weekly fitness events, photo classes and art exhibitions throughout the resort. Keep reading for all the different ways to take advantage of the spring temperatures, whether you’re sipping wine or practicing your tree pose. 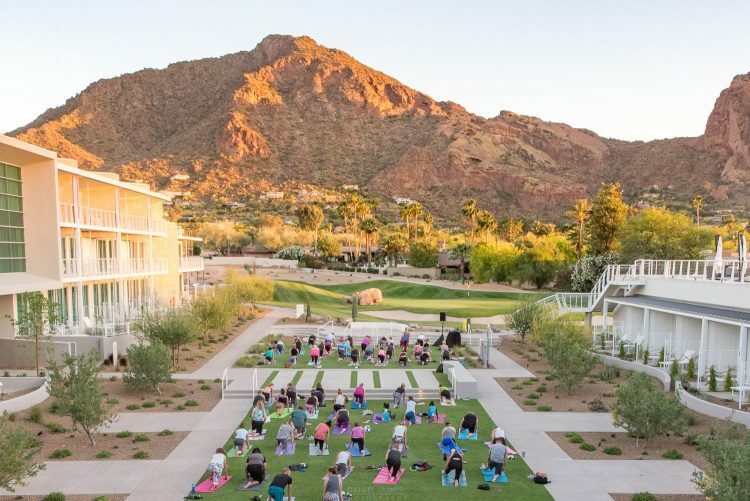 Sponsored by Karma Juice, this outdoor series of yoga sessions is hosted by a variety of local yoga studios and is topped off with giveaways and wine. Afterwards, kick back in The Living Room for bites and select $5 wines or keep the heart rate going at the resort’s fitness center and outdoor pool that were unveiled during Mountain Shadows’ opening. Moonlight Yoga: March 18 & April 15 at 7 p.m., May 20 & June 10 at 8 p.m. Located at the resort’s Camelback Overlook rooftop deck, guests and locals can take part in a flow session with Veronica Clark while watching the moon light up the night sky. Afterwards, enjoy a craft cocktail at Hearth ’61. $25 per person. Includes class, parking and glass of wine. Spring Photography Essentials: March 24, April 28, May 19 from 2 to 4 p.m. The resort’s monthly photography class will include an informative session from 2 to 4 p.m. followed by apps and cocktails from 4 to 5 p.m. Photographer and blogger Joanie Simon will lead the class and teach how to work with light and shadow, compose a shot and the essentials of shooting and editing, whether with a camera or phone. Guests will get to try their hand at shooting a variety of shots around the property including portrait, architectural and food and drink. $50 per person. Includes a cocktail, appetizer and day valet parking. Guests are required to bring a camera or phone to use. The Gallery at the resort features museum-like exhibitions from artists with connections to Arizona, with new works debuting every two months. This spring, “Go Figure” will feature works by five figurative artists including Jeff Bertoncino, Philip C. Curtis, Daniel Funkhouser, Beverly McIver and John Millei. The Arsenal Effect: April 7, 10:30 a.m. Enjoy a heart-pumping workout with fitness guru Kenyatta Banks who’s known for his world-renowned workout “The Arsenal Effect.” The HIIT-style workout will include an hour of high fat-burning cardio plus stunning views and high-energy music. Relax afterwards and catch some rays poolside at the resort’s Citizen Club pool. $20 per person. Includes class and access to the resort’s Citizen Club pools all afternoon. RSVP here.